Over at A Belle, A Bean, and a Chicago Dog there is a link up party happening called I Was a Senior Hottie. I wasn't a senior hottie by any means, but I thought it was a fun link up and I decided to join in with a few pictures from my senior year. I searched and searched for a copy of my senior picture, but I guess I don't have one. So here is a scan straight from the yearbook, which is why it looks a little grainy. Okay, seriously, I would love to have glowing smooth skin like that again (stupid age marks). The picture below is from senior prom. I'm actually friends with all 3 "Spongebobs" in this picture on Facebook, but seeing as how none of them know about my blog and I don't really feel like sharing (and seeing if they minded being on it) I decided instead to protect their anonymity with our handy-dandy sticker collection. 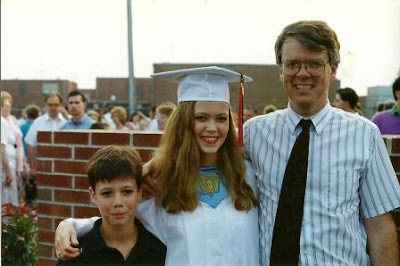 And finally, a picture from graduation, with my brother Taylor and my Dad. My youngest brother, John, was not yet 2 years old and must've been with my mom, taking the picture. What you can't tell from this picture is that I had on the most dreadful hot pink lipstick. Whew, it was bad! If you want to link up your pictures, head over to A Belle, A Bean, and a Chicago Dog - her linky is open through Monday. I am so glad you got this post up! The pictures are wonderful. I love your prom dress. I had the same curly hair. Mine was a perm but since I had it all through high school everyone thought I had curly hair. You really WERE a senior hottie!!! You are beautiful!!! I bet you were a cheerleader and had lots of boyfriends. I clicked on the last picture to see that lipstick, but I can't make it bigger, shoot! Bet you're glad! 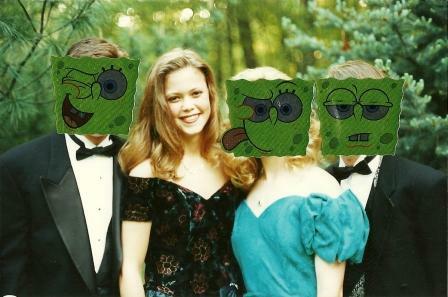 O.K., I thought they all wore Spongebob masks to the prom!!!! What an IDIOT I can be early in the morning before coffee, ha ha! I have a senior picture of you. You were a senior hottie! Thanks for stopping by my blog this morning. hope you'll visit often. I loved this post. I won't be posting my senior picture though - I hated it. 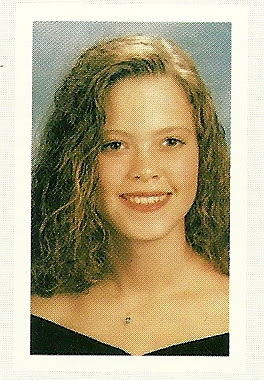 Actually, my junior picture was acceptable, but not the senior pic - the one that really mattered! Checking out more of your posts! The scanned picture from your yearbook is beautiful. I only wish I had skin like that in High School or now for that matter. My hair is naturally curly like that so now I spend every morning blowing it out straight. Lets see if this comment works!! Aww, you were/still are(!) so pretty! And the stickers are perfect! Aww, what pretty pictures and memories! You were so cute. I love your hair for your prom. Beautiful. You were a senior hottie! I really like the way you cropped out your friends faces on the prom picture. This was fun. You are doing great on the fitness challenge. Keep up the good work. I look forward to hearing how this last week went! Awesome pictures, you most definitely were a hottie! I did the link up to, so fun to see all these pics! I have to agree with everyone else-you were a hottie! I was happy that year because I'd finally gotten contacts-but my hair do was a different story all together. Bad doesn't even begin to cover it! Your pictures are great! You missed the bad hair era all together! Lucky you! Lisa! OMG! You look adorable! I love these pics. Fantastic! :) You look so cute. I love the hair and the flawless skin. Excellent shots. Thanks for the trip down memory lane. Your hair is gorgeous! And your complexion! So pretty! You not having bangs helps make you a true Senior Hottie! Thank you so much for diving right in! You look so precious in every shot---you're too hard on yourself! And the funny thing is we're all lamenting the loss of our smooth skin. LOL! I'm happy you linked up, this was fun! So pretty!!! Senior hottie indeed!